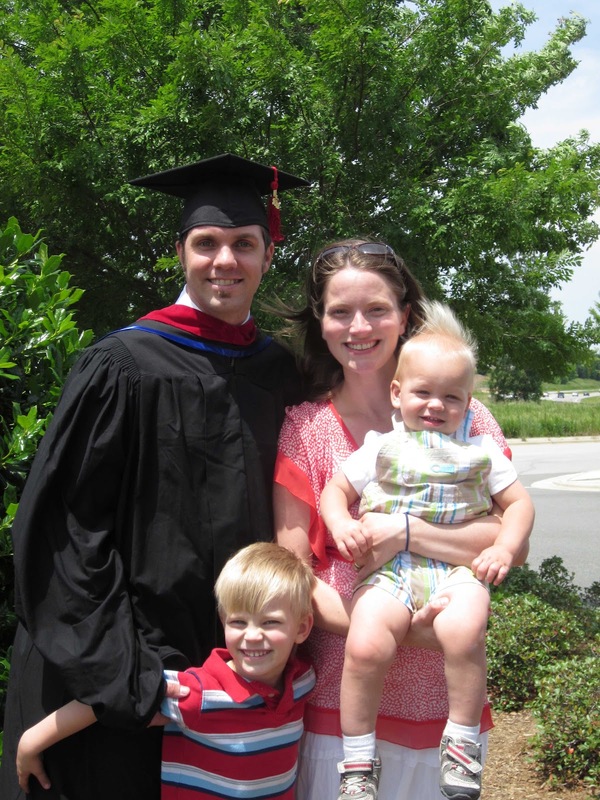 Rob graduated with his Master's of Divinity this past weekend. Yay! There were definitely (lots) of tears shed :) We are absolutely grateful to God for sustaining us as we walked through a very challenging four years of school :) We have been here in Wake Forest, North Carolina as he has been attending school for half of our marriage. Our little family has increased from 3 to 5 (Hannah Jane will be here in September! :)). We have had lots of joys, lots of tears, lots of laughs, lots of incredibly hard days, lots of incredibly wonderful days, lots of late nights, lots of early mornings. And God has sustained and grown us tremendously through it all. We praise God that we have met amazing people, developed lifelong friendships, and been blessed with an amazing support system through our church and small group. I can only express here in words how thankful to the Lord and how proud of my husband I am - how he maintained A's and B's in a 90-hour Master's degree program, worked as many as 5 part-time jobs at one time so I could stay home with our children, and still been a wonderful husband and loving daddy through it all. And he will be the first to say that it is all by God's grace and that the joy of the Lord was and is his strength! Congratulations to all of you! And all the best with what unfolds for your family in the future. How great is this news! Congrats!